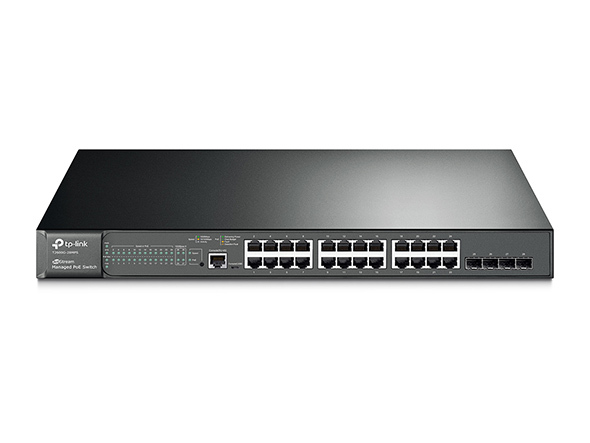 The T2600G-28MPS provides 24 Ethernet ports (10/100/1000 Mbps) compliant with 802.3at/af PoE. Users can supply up to 384W total power to connected devices and flexibility deploy equipment such as wireless access points or IP cameras without worrying about power outlets. PoE support together with high-performance static routing, enterprise-level QoS, advanced security features and a choice of Layer 2 management options make T2600G-28MPS a great choice for small and medium-sized businesses. Layer 2 and Layer 2+ features include OAM, L2PT and sFlow to meet the needs of ISP customers, while IP-MAC-Port-VID Binding and Access Control List (ACL) functions protect against broadcast storms, ARP attacks, Denial-of-Service (DoS) attacks and other threats. Quality of Service (QoS) provides enhanced traffic management capabilities to ensure fast transfers for your important data, even when the network is busy. Moreover, easy-to-use web management interfaces, along with CLI, SNMP, RMON and Dual Image mean faster setup and configuration with less downtime. T2600G-28MPS is the perfect network solution for budget-conscious workgroups and departments who want to upgrade to boost their network to gigabit speeds. 24 IEEE 802.3at/af-compliant PoE ports supply up to 384W total power to 802.3at and 802.3af devices. Set up wireless access points, surveillance cameras, IP phones and other PoE devices quickly and easily, without the hassle and cost of installing power cabling. Security features include IP-MAC-Port-VID Binding, Port Security, Storm Control and DHCP Snooping to defend against a range of network threats. An integrated list of common DoS attacks is available, making it easier than ever to prevent them. In addition, the Access Control Lists (ACL, L2 to L4) feature restricts access to sensitive network resources by denying packets based on source and destination MAC address, IP address, TCP/UDP ports or VLAN ID. Users’ network access can be controlled via 802.1X authentication, which works with a RADIUS/Tacacs+ server to grant access only when valid user credentials are provided. Voice and video traffic can be prioritized based on IP address, MAC address, TCP port number, UDP port number and more. With QoS (Quality of Service), voice and video services remain smooth, even when bandwidth is in short supply. 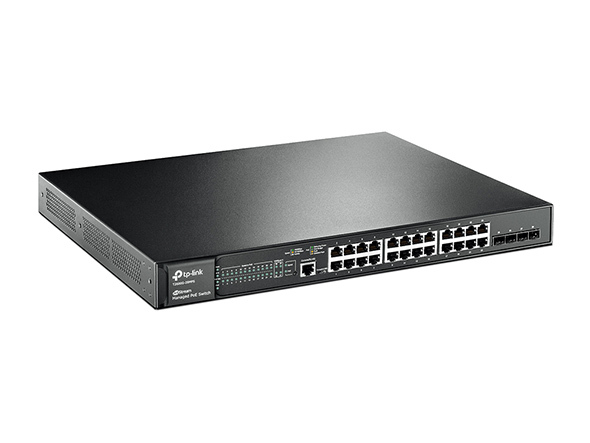 T2600G-28MPS supports a complete lineup of L2 features, including 802.1Q VLAN, Port Mirroring, STP/RSTP/MSTP, Link Aggregation Control Protocol and 802.3x Flow Control. Advanced IGMP Snooping ensures the switch intelligently forwards multicast streams to only the appropriate subscribers, cutting out unnecessary traffic, while IGMP throttling & filtering restrict each subscriber on a port level to prevent unauthorized multicast access. Static Routing, an L2+ feature, is a simple way of segmenting the network and internally routs traffic through the switch for improved efficiency. sFlow, QinQ, L2PT PPPoE ID Insertion and IGMP authentication features are provided, developed with service providers in mind. 802.3ah OAM and Device Link Detection Protocol (DLDP) offer easy monitoring and troubleshooting of Ethernet links. IPv6 functions such as Dual IPv4/IPv6 Stack, MLD Snooping, IPv6 ACL, DHCPv6 Snooping, IPv6 Interface, Path Maximum Transmission Unit (PMTU) Discovery and IPv6 Neighbor Discover guarantee your network is ready for the Next Generation Network (NGN) without upgrading your hardware. T2600G-28MPS is easy to manage via an intuitive web-based Graphical User Interface (GUI) or an industry-standard Command Line Interface (CLI). For both management methods, traffic is protected through SSL or SSH encryption. SNMP (v1/v2c/v3) and RMON support enables the switch to be polled for valuable status information and to send traps on abnormal events. Microsoft® Windows® XP, Vista™, 7, 8, 10, MAC® OS, NetWare®, UNIX® or Linux.